Jeje Lalpekhlua provided the decisive strike as Chennaiyin FC edged out Colombo FC 1-0 in the second leg of their AFC Cup playoff tie to secure their spot in the group stages of the tournament. The game being played at The Arena by TransStadia in Ahmedabad saw its decisive moment come in the second half when Chennaiyin's marksman capitalised on an error from the Colombo defence to power the ball home for the winner. The tie stood at 0-0 after the first leg in Colombo and both teams had it all to play for in the second leg. After a first half of few chances, Chennaiyin took hold of the game by bossing the possession to start the second half. An extended spell where they moved the ball better and put pressure on the opposition eventually yielded the goal in the 68th minute. Tondonba Singh's cross from the left into the box saw the Colombo defence fail to deal with it effectively. Duckson Puslas failed to intercept the initial cross and Chalana Chameera who was behind him failed to control the ball, providing Jeje with a fantastic chance to score which he took with aplomb. Chennaiyin then saw out the game to ensure that Colombo didn't score any away goals and secured enter the group stage of this year's AFC Cup competition. Chennaiyin coach, John Gregory, sounded relieved at his side's progression, after what could have been a tricky evening. He was pleased with the interplay of his forwards - Jeje and CK Vineeth. "Jeje had a lot of support today", said Gregory at the post-match press conference. "We had Vineeth playing close to him. We were very positive in our game and it was important Jeje had someone to share the workload with. I think they both complement each other well. Thoi and Isaac worked hard." The progression marks a positive for Chennaiyin after what has been a dismal season domestically and Gregory said the club is looking forward to this Asian campaign. "We've had a tough season. Our confidence was very poor as a result. We should have scored three or more goals. I don't care if it was 1-0 though. We qualified and kept two clean sheets against a good team . A champion team who has a +20 goal difference in their league. But we won and qualified for the group stages. The whole of our club has been geared up to represent our city in Asia now." The goal scorer Jeje also accompanied his coach to the post-match interaction and spoke about how a half-time team talk resulted in an improved second half showing. "I think this season has been really hard. We worked hard but i think it was not ours in the ISL", said the Mizo forward. "Today, we pushed hard and had a lot of chances. At halftime, we had a chat and wanted to push on. We got a goal and capitalized. I think it was one of the most important games I've played." Colombo coach Ruwan Priyantha Kumara meanwhile was left to reflect on losing out after holding on gamely for so long. He lamented his side's exploits in their national league back home and its subsequent toll on his players as one of the reasons for the team's exit. "Chennaiyin FC players were physically dominant and we had no rest. We have been playing consistently for six months now. We had our chances but could not convert them. We made a small mistake and they scored", said Kumara. "We have many national players who we couldn't play because of fatigue and injuries." 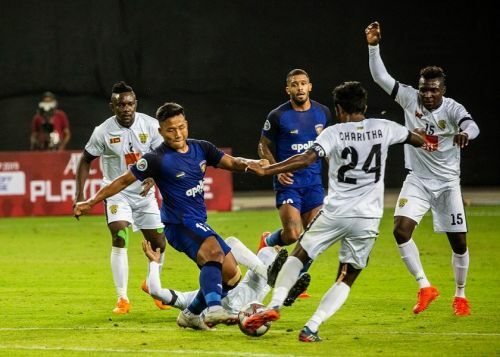 Chennaiyin will now compete in Group E with Dhaka Abahani from Bangladesh, Manang Marshyangdi from Nepal and fellow Indian side Minerva Punjab, who failed to make it past the qualifiers of the AFC Champions League.